Hannah Shapiro tied for the runner-up spot with Ken McNickle on Survivor: Millennials vs. Gen X's finale. Adam Klein was instead revealed to be the winner of its $1 million grand prize on Wednesday's two-hour CBS broadcast. Hannah, a 24-year-old barista from West Hollywood, CA, and Ken, a 33-year-old model from Denver, CO, both received zero votes to win in the season's final jury voting results. Adam, a 25-year-old homeless shelter manager from San Francisco, CA, won Season 33 of Survivor in a clean-sweep jury vote. Hannah, however, maintained that she was a better player than her Final 3 opponents and deserved to win the game. 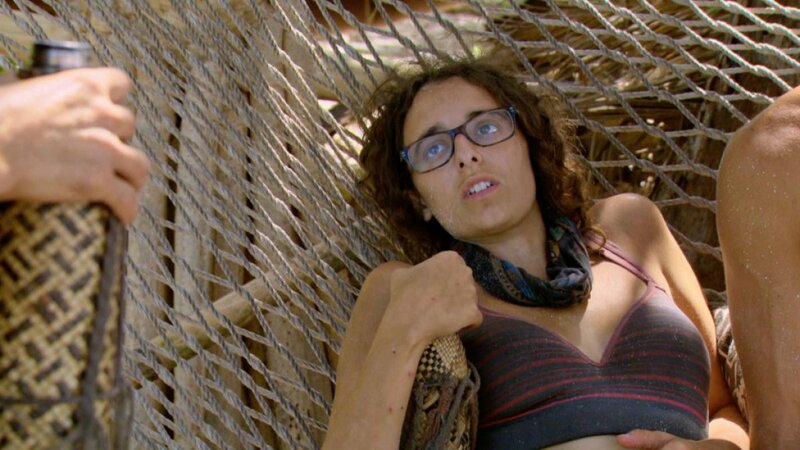 During an exclusive interview with Reality TV World on Thursday, the day after the finale, Hannah talked about her Survivor loss and overall experience. Below is the concluding portion. Click here to read the first half. Reality TV World: When did you find out David Wright had created Justin "Jay" Starrett's fake idol? And what was your reaction to that? Hannah Shapiro: So Dave and I were very close. Dave is basically the Gen X version of me. (Laughs) We would have these thoughts and they'd be the same thoughts and then we'd be like, "How is this happening?!" Dave is an incredible human. But yeah, we had a close relationship. So Dave actually told me about his fake idol, gosh, it was before Jay found it actually. Dave told me about it before the [Sunday Burquest] vote. He was like, "Listen, I made a fake idol." Dave said that if he got voted out, he was going to leave it as a ghost idol in the game. But instead, Jay found the fake idol. And as soon as Jay pulled it out, I knew what it was, because Dave had mixed the paints from the merge flag. So yeah, Dave and I were close and I knew about Dave's fake idol for a bit. Reality TV World: When Dave was advocating voting Adam off before Bret LaBelle, he said he saw himself going to the Final 3 with you and Ken. And you seemed onboard with that plan, so was that really the case at the time? If so, when did you change your mind and decide to go to the Final 4 with Adam instead of David? Had that already been your preference? Hannah Shapiro: I was never going to sit at the end with Dave. Dave and I joked after the game that we had this deal with each other, but Dave knew not to trust me. I knew that Dave knew he couldn't trust me, and the jury would've wet themselves had they had Dave in the Final 3. The jury wanted to vote for Dave so badly. I'm not blind to this. I was using Dave as a shield as long as I could. Many people for a while did want to sit with Adam, and I was trying to get to the end with Adam and Ken. And whether or not that was the right decision -- I mean, obviously it was not the right decision -- and whether that should've been clearer to me or not, it's way easier in retrospect sitting on your couch at home. But no, I think the jury didn't fully understand that I knew I couldn't sit with Dave, but I took a huge, huge, huge risk and brought Dave to four. It was a risk and the jury didn't understand that it was more of a risk. Reality TV World: Can you elaborate a little more then on why you thought it was better to take out Bret before David since David was going to be on your chopping block anyways? Hannah Shapiro: Yeah, a lot of it had to do with Ken. You have to understand that, like, Ken goes off on these speeches about loyalty, and I felt like if I throw [away] Ken's trust and Ken won Final Immunity -- while Adam would have also broken his trust -- we sit it play out time and time again that people are more hurt when I make a move against them. A lot of my risky moves had to do with having to appease Ken's sense of what Survivor was. And the other thing was that Adam was not as clear, you know, a threat or a winner as it is sitting at home. And so, keeping Bret in was a risk. Reality TV World: You said you didn't think Bret wanted to sit next to you in the end. So were you convinced he wanted Adam and Ken in his Final 3, and if so, how did you come to that conclusion? Because Bret told me you were definitely in his Final 3 plans. Hannah Shapiro: Well, it's tricky. I think that in retrospect, you know, Bret could've come to me and explained that that's not what he wanted, but I remember standing by the water and Bret was like, "I hear a lot of the millennials don't like Adam," and I wasn't sure where Bret's head was at. Bret had played a very, I'd say, like, emotional, passionate game and sometimes had done things that were not strategically in his best interest. And so, I was trying to [figure] out where his head was at, and I wasn't getting a good enough read. And listen, it was a risk. Was it the wrong move to let Dave get to four? Maybe. But that's the decision I made after a lot of thought. Reality TV World: How surprised were you that Adam found a real hidden Immunity Idol before Final 5 Tribal and did you ever outright tell David that Adam had found it? Hannah Shapiro: Yeah! So Adam came to me and told me that he found the idol, and when I made the decision to keep Dave until four, I told Dave that Adam had an idol. Everyone was very open with me about what their plans were, and a lot of it was because of the way I sort of, like, let my goofiness get their guards down. So, yeah, I knew Adam had an idol and I did tell Dave that Adam had an idol. Reality TV World: Why would losing Ken's trust have been such an issue for you if you had voted David off first before Bret? Because once David was gone, Ken still wouldn't have the numbers to be able to vote you off. Were you thinking from the perspective of losing Ken's potential jury vote? Hannah Shapiro: No, I wanted to sit at the end with Ken. I never wanted to send Ken to the jury. Ken was so key to my game because I felt like he was someone that I would have a strong case against at the end, and the reason why, was because Ken was a challenge beast. So Ken knew there was a huge chance he was going to win the challenge, and again, if I had broken Ken's loyalty as a woman and as someone that Ken felt he had a personal relationship with, Ken acted sometimes irrationally off of emotions, and he could've been so hurt that he -- despite Adam and Bret also turning against Dave -- he could've put more blame on me. I spent many, many days with this man, and this was the analysis I came to. To read the first half of Reality TV World's exclusive interview with Hannah Shapiro, click here. Also, check out our Survivor page for more interviews with this season's Final 6 castaways. Jill Duggar and husband Derick Dillard announce Baby No. 2 is on the way!